"Fiction editor/author answers questions in upcoming teleseminar. Moody Fiction Editor Andy McGuire will answer your questions in a free live 70-minute telewebcast this Wed., Jun. 18, at 4 p.m. Pacific/7 p.m. Eastern. 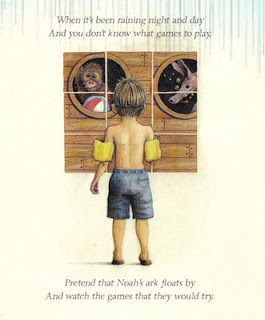 Host Terry Whalin will use the questions from various participants to grill McGuire about the publication of his first children's book, Rainy Day Games, Fun with the Animals of Noah's Ark (Harvest House Publishers). Anyone can ask a question at: http://www.askandymcguire.com/ and register for the free teleseminar. Participants in the free teleseminar can also ask McGuire questions about his day job as the fiction editor at Moody Publishers. Each person who registers for the teleseminar at: http://www.askandymcguire.com/ will receive a free four-chapter e-book called Novel Curriculum by Andy McGuire. This 47-page e-book will help writers understand some of the basics related to creating and shaping Christian fiction. Don't have time to listen during the workday? The event will be recorded and every registrant will receive access to the replay links, which can be downloaded to a computer or iPod." OK, maybe you are not a fiction writer or children's author, can you learn something from this post for your writing life? There is no doubt in my mind. First, notice the technology. Sign up and notice you can hear the author talking, then when you ask your question, you get to the confirmation or mirror page where you make sure you have your question worded as you want it. Once again you have a personal connection to this author. Finally when you ask your question, you reach the confirmation page where you will hear me talking and confirming your registration. Check out this confirmation page and notice it's where you download the free 47-page Ebook from Andy McGuire about writing fiction. Also this page is where people get the call-in number for their phones or they can listen to the interview on a live webcast (free). Also this page has a countdown timer highlighting when the event will take place. Notice at the bottom of this page there is a tool so the registrant can tell a friend about the event. There is a large button in the middle of the confirmation page which encourages people to purchase copies of Rainy Day Games. Does it work? I've already received an email from one participant who has purchased the book. My mentor on virtual book tours, Alex Mandossian has specific sales results from these events. With one book and one author, Alex can point to over 3,500 book sales. Now when you realize that many books don't even sell 500 copies in their lifetime, if someone sells over 3,500 copies of an authors book, that is a huge deal. People who sign up for the event also receive two confirmation emails. Why two? Because of not all email reaches its original destination and the dual emails helps raise those possibilities. I've prepared the author for this event, sent the questions from the participants and I will be sending another batch later. The author can be confident about the time on the telephone with me because they know what information the audience wants before the event. Finally notice how easy this event is for the author. They don't travel anywhere or sit in a bookstore wondering if someone is going to come for a book signing. They have over 100 people gathered in a virtual event just to listen to them talk with the host on the telephone. In terms of time and expense, a virtual book tour is one of the most effective ways to sell books as Alex says, "Quicker, faster and with less human effort." Yes some other people are touting other technology events like blog tours. No one has yet shown me that blog tours sell books with specific results. Yes it gives some exposure to the book but in terms of results I've found zero evidence that translates into sales. Call me a skeptic but I want to put my time and energy into events which sell books and are a winner for the author and the publisher. There is no better way than a virtual book tour--at least that I've discovered to date. I want to point to the Church of the Customer Blog and their post about The Word of Mouth Manual. It's a great resource for you to get this book and learn about how the publishing industry should reinvent itself. Virtual Book Tours fall into this same area of innovation. Finally I wanted to show you the back cover of Rainy Day Games and wonder who was Andy McGuire thinking about for a model when he drew that illustration. Maybe we'll find out tomorrow night. Hope you can make it.